"Do you know that you'd have lost your head had it not been so lovely?" Although Ernst Lubitsch is best known for his sophisticated comedies both in Germany and in Hollywood, he also did his share of historical costume dramas. One of the most notable of these is this biopic of Anna (or Anne) Boleyn, with excellent production values and featuring some evocative and emotionally wrenching lead performances. 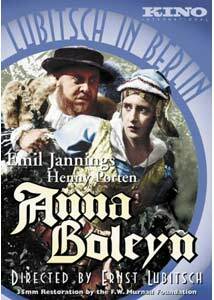 Young Anna (Henny Porten) returns from France to England, where she is to become a lady-in-waiting to Queen Catherine (Hedwig Pauly-Winterstein), wife of Henry VIII (Emil Jannings). But Henry has both a roving eye and a boredom with his current wife, and when his eye falls upon Anna, he determines to make her his own. When the pope objects to the King's requests, Henry responds by declaring himself head of the Church of England and orders his marriage annulled so he can marry Anne. While all seems well at first, after Anne gives birth to a daughter instead of a son, Henry begins to rove again, this time settling upon lady-in-waiting Jane Seymour (Aud Egede Nissen). Before long, Anna finds herself under trial for adultery, and even her uncle, the Duke of Norfolk (Ludwig Hartau) turns on her. There are a number of interesting dualities at work in the script: Anna's ascension begins with a court proceeding (the annulment of Catherine's marriage to Henry), and her descent is complete in one (her trial and execution). Although she remains faithful to Henry, her affections still lie with Sir Henry Norris (Paul Hartmann), who rejects her early on, believing she loves Henry. Minstrel Mark Smeaton (Ferdinand von Alten) uses this knowledge to first try to coerce Anna into sharing her affections with him, and upon being rebuffed he begins to poison her in the King's ear. And of course, there are the two Henrys competing in Anna's heart, alternately loving and rejecting her, both at the most inopportune times. Where Anna's rise from the court is presented as unwilling, and she has no intentions of making Catherine a discarded queen, Jane has no such compunctions and even has the brass to expressly compare her own seductions of the king with Anna's own career as lady-in-waiting to Catherine. Certainly the picture's sympathies lie with with title character. Anna is pretty well portrayed by Porten, who had a career in films stretching nearly fifty years (though virtually none of her output other than this picture is available in the US in any home video format). She does a fine job of bringing Anna to life, without excessive histrionics (compare the overwrought antics of Pauly-Winterstein), making her quite palatable to the modern viewer. She doesn't stint on raw emotion, though, with palpable pain at her rejection by Henry and her longing for her daughter Elizabeth to be accepted by him. The great Emil Jannings takes the role of King Henry VIII and runs with it, setting a template that would be followed closely by Laughton a decade and a half later. Jannings' Henry is both lusty and headstrong, but most of all he portrays him as a naughty, spoiled boy. Every now and then, when he does something particularly rash or outrageous, Jannings can be seen darting his eyes briefly side to side, as if to check whether any adults have caught him at his misbehavior. It gives him a certain bad boy charm that doesn't allow him to be dismissed as a one-dimensional villain. Particularly notable is the picture's treatment of the question of heirship. In the case of the divorce from Catherine, her failure to produce a male heir is treated as an excuse, a reason to have her put out of the way. But when Anna also renders a daughter instead of a male heir to Henry, his distress is palpable, and it brings a very real change in his attitudes toward Anna. While the motive remains the same with respect to the two queens, its impact is quite different upon him, and as a result Anna must be dealt with much more severely than Catherine. It is this failure that makes Henry all too accepting of Smeaton's lies and accusations; had Anna produced a son it's quite plain Smeaton would have been thrown out forthwith. But under the circumstances, Anna is doomed by an accident of genetics. The story makes her into a purely tragic figure as a result, miserable in her queenship and undeserving of her fate. The production design is quite lavish, with the costumes in particular looking like a living Holbein painting. The set decoration is elaborate at times, though it also can be stark under appropriate circumstances. Lubitsch occasionally uses an odd framing, with a tall and narrow picture that sports black bars on each side, when he wants to emphasize a single character. He first uses this at the wedding feast, separating Henry and Anna quite effectively, and foreshadowing their isolation even though at the moment they're right together and seemingly quite happy with one another. The story has a sense of unyielding fate, with passions and deceptions ultimately triumphing over good intentions and innocence. It's a somewhat grim look at royalty, though perhaps that was inevitable in 1920 Germany, which had just dispensed with a disastrous Kaiser. Image Transfer Review: The full-frame transfer has both good and bad aspects. On the very positive side is the fact that the source print, a tinted original nitrate from the Milan archives, is in beautiful condition, with hardly any damage. There are occasional flickers and some exterior scenes are quite contrasty, but on the whole this is a superb print for its age. Unfortunately, corners were cut in making the PAL/NTSC conversion and there is plenty of conversion ghosting and combing throughout. Those not bothered by conversion artifacts will be quite pleased; those who are may find it makes the picture unnecessarily blurry when there is motion. Audio Transfer Review: A new piano score is contributed by Javier Perez de Azpeitia. It has excellent presence and a nicely vibrant warmth throughout. Although it's primarily a compilation score, the music selected is almost always scene-appropriate and suitable to the onscreen action. Often it's quite evocative and the excellent recording quality doesn't hurt one bit. Hiss and noise are practically nonexistent. Extras Review: The extras provided are rather slim. A filmography for Lubitsch contains little beyond dates and titles, while a gallery contains about 20 stills (half of which are glamour shots of Porten), plus a vintage glass slide advertising the US version, Deception. Chaptering is a bit on the thin side as well. An interesting and lavish historical drama, from a beautiful nitrate print.